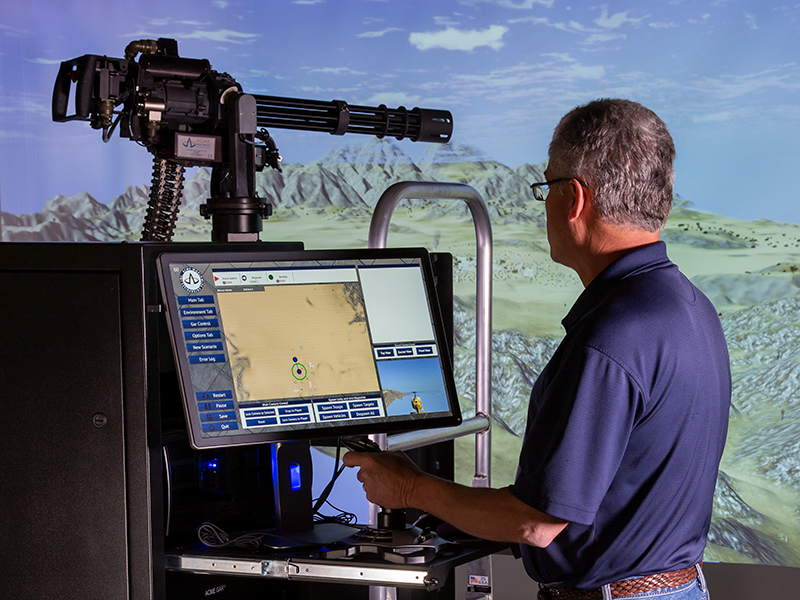 ACME’s Gun Active Recoil (GAR®) Gunnery Training System (GTS) is complete helicopter gunnery Training. 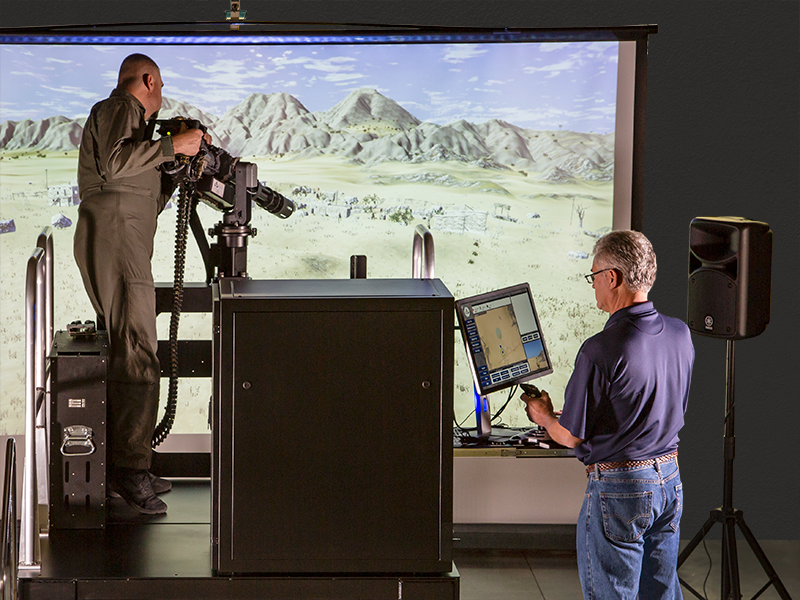 Turn-Key system includes everything needed for realistic, out-the-window helicopter gunnery training. 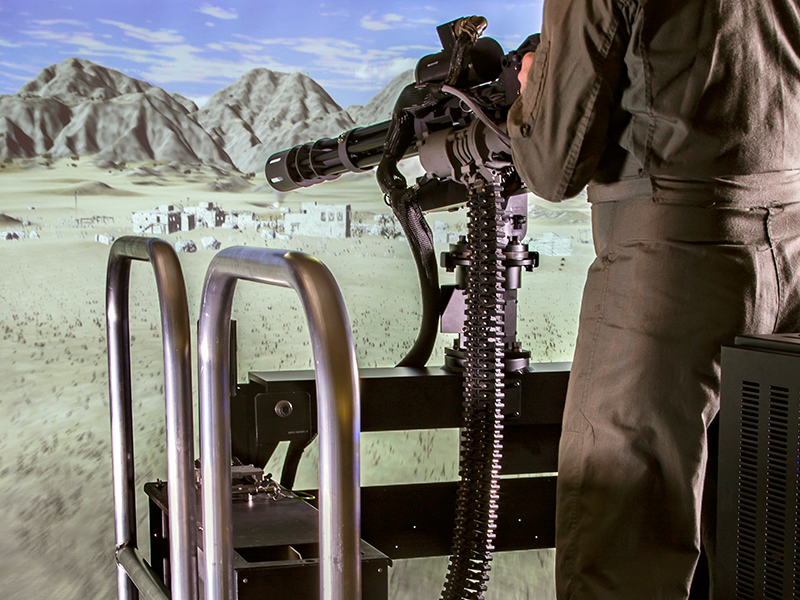 Look out and down from the platform onto immersive environments with insertable, intelligent targets. Engage with realistic replica weapons that look, feel, and function like the actual weapons. Train everything – Practice weapon skills with ultra-realistic replica weapons filled with sensors and logic that ensure gunners load, arm, charge and fire properly. Full-force recoil at any rate of fire and windloading forces on the barrel in the airstream train gunners to adapt to and overcome the loads. 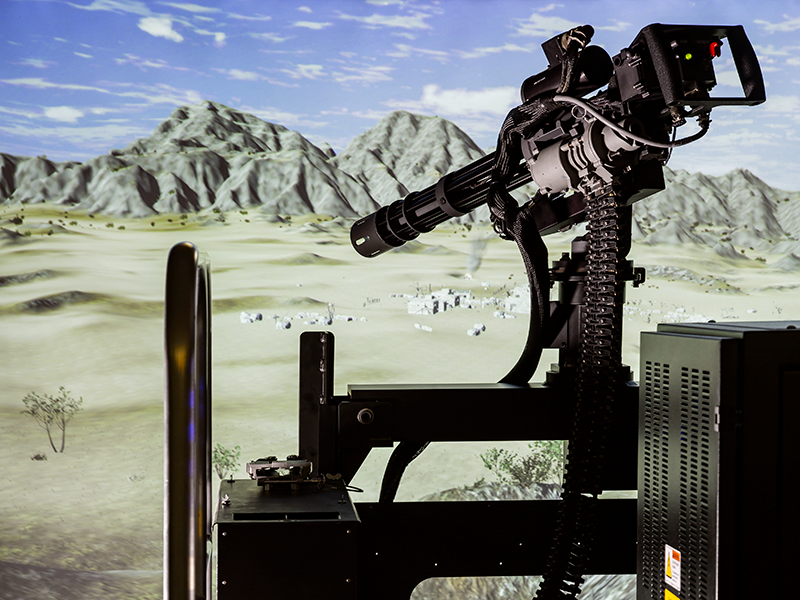 Insertable malfunctions challenge gunners to recognize and resolve realistic weapon issues to stay in the fight. Fly the helicopter or engage pre-set patterns to help gunners to practice keeping on target during aircraft maneuvers and acceleration, attitude, and altitude changes. Use true-to-life ballistics and bullet flyout to score gunner effectiveness on settable, easy-to-destroy-or hardened, resilient targets. 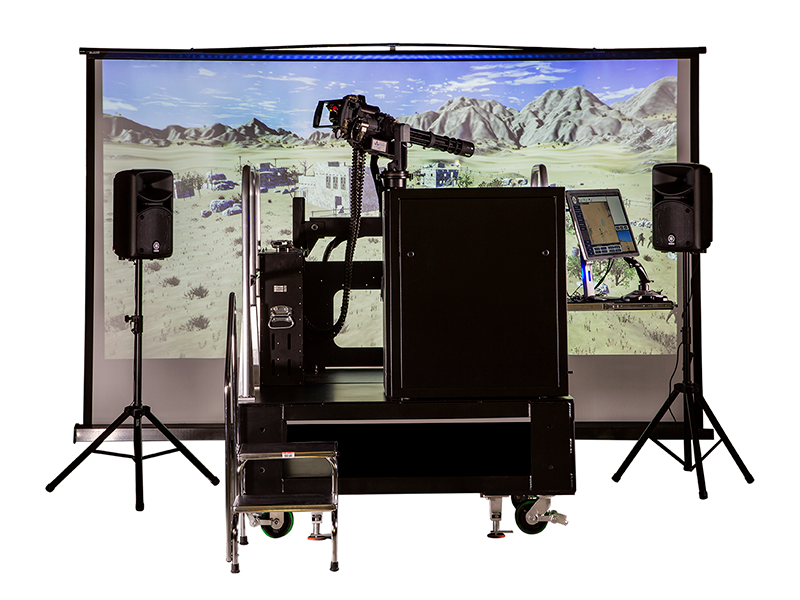 Train anywhere – Simple set-up with wheeled, modular gunnery platforms that fit through standard office doors. Self-contained electronics on-board require just a single power connection. 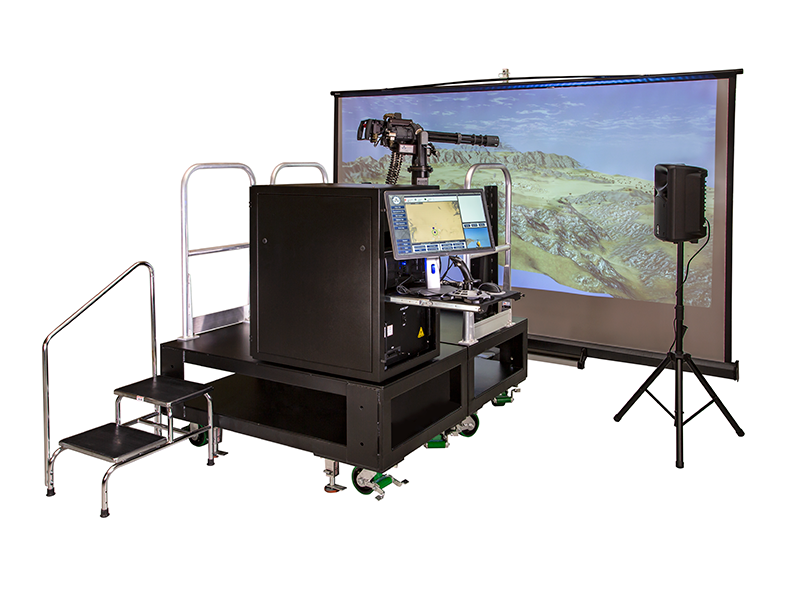 Integral, pull-out instructor station provides complete control of the simulation from discrete position below and behind the trainee. Powerful projector needs just 18 inches clearance to throw vibrant images onto 12-foot wide and 10-foot high retractable screen. Deployable speaker system brings powerful bass vibration and intensity of the helicopter and the weapon fire into full-focus from anywhere around the trainer. Training for any hard-mount machine gun platform!